Lock in a great price for Hyatt Regency Phuket Resort – rated 8.1 by recent guests! Extensive buffet catering to diverse tastes (vegetarian section). Good size rooms. Property well managed. Very bad location away from everything. You have to pay 500 baht to go to Patong each way for taxi . Kamala beach is complete dirty and will cost 200 baht in Taxi one way . In the hotel it’s impossible to walk around as you have to rely on club car from room to lobby etc . Food is more expensive than UK . The location was central to Kamala Beach, on the outskirts of the village to quiet and peaceful. Views - amazing. Pool(s) - amazing. Food - amazing. Cocktails - fabulous. Staff - out of this world - the staff were exceptional, so friendly and helpful. The front dest and housekeeping responded quickly to our needs We had an issue with the bathroom door but the manager wrote a personal letter to apologize which was a great gesture. Hyatt Regency Phuket Resort This rating is a reflection of how the property compares to the industry standard when it comes to price, facilities and services available. It's based on a self-evaluation by the property. Use this rating to help choose your stay! One of our top picks in Kamala Beach.Offering an outdoor infinity pool, Hyatt Regency Phuket Resort is located up a steep hillside overlooking Kamala Bay at the southern tip of Kamala Beach. It provides modern air-conditioned rooms with free WiFi. Other facilities include a fitness center, kid’s club and restaurants. The property is 6.2 mi from Patong Beach. It is 1.2 mi from Phuket FantaSea and 19 mi from Phuket Airport. There is a complimentary scheduled shuttle service to Kamala Beach during the day. Rooms feature a balcony with great views. They come with a 40-inch flat-screen cable TV, mini-bar and electric kettle. Private bathrooms are equipped with a bath and separate shower. For guests’ convenience, the property has a tour desk and laundry service. Guests can enjoy all day international dishes at The Pool House and can mingle beside the pool with a refreshing cocktail, fine wine or homemade Thai iced tea at The Pool Bar. For BBQ specialties, head to Sunset Grill. When would you like to stay at Hyatt Regency Phuket Resort? The 67-sqm Deluxe Rooms are located in the corner with a balcony equipped with a daybed and views of the sea. Measuring 44-sqm with sea views, the room features its own 65-sqm terrace equipped with sun loungers and a shaded living/dining area with a Jacuzzi®. Measuring 48-sqm of living space, the room comes with a work area and a balcony with views of the sea. Measuring 64-sqm, the room comes with sea views, a balcony with a daybed and a private plunge pool. Measuring 46-sqm, the room comes with a work area and a balcony that overlooks the sea. The 44-sqm room comes with a living and dining area, a 65-sqm terrace equipped with sun loungers and a Jacuzzi®. Guests enjoy exclusive access to the Regency Club Lounge. • Exclusive access to the Regency Club Infinity Pool (adult only) from 08:00 - 17:00 hrs. • Complimentary WiFi internet access. 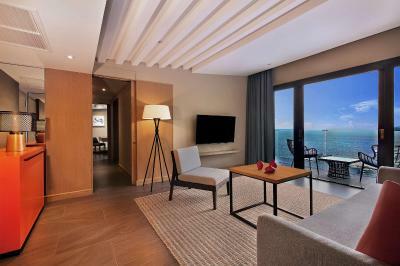 The 48-sqm room comes with a work area, a balcony with sea views and access to the Regency Club Lounge. additional fees. This fee will be inclusive of the Club benefits as well as breakfast. Please contact the property directly for the cost and any other additional details. The 67-sqm room comes with a living and dining area, a terrace equipped with a daybed and access to the Regency Club Lounge. Please be informed that an extra 3rd person (children and adults) staying in the "Club" rooms with access to the Regency Club Lounge will be charged a different amount for the Children and extra beds additional fees. This fee will be inclusive of the Club benefits as well as breakfast. Please contact the property directly for the cost and any other additional details. Measuring 46-sqm, the room comes with a work area and a balcony with an outdoor seating area. This 97-sqm 2-bedroom unit features a shaded balcony with an outdoor seating area. This 93-sqm corner room comes with a dining area, terrace, a daybed and a private plunge pool. Guests enjoy exclusive access to the Regency Club Lounge. Located on the highest point of the resort with stunning views, the suite measures 82-sqm of living space and comes with a separate living room. Guests enjoy exclusive access to the Regency Club Lounge. The King Suite is composed of 2 bedrooms, a separate living area and a large terrace with an outdoor seating and dining area. The suite measures up to 101 sqm of living space. Guests enjoy exclusive access to the Regency Club Lounge. The 60-sqm King Rooms come with a lounge area, a balcony with a private plunge pool and ocean views. Guests enjoy exclusive access to the Regency Club Lounge. Nestled on the hillside overlooking Kamala Cove, the resot offers rooms with large balcony, some with private dipping pool. All Regency club guests have access to the large infinity pool. 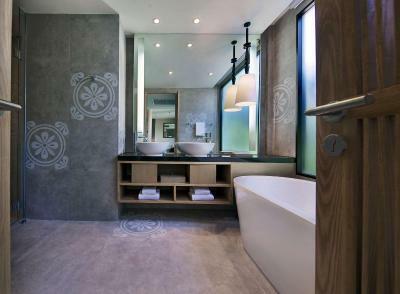 House Rules Hyatt Regency Phuket Resort takes special requests – add in the next step! Hyatt Regency Phuket Resort accepts these cards and reserves the right to temporarily hold an amount prior to arrival. Please be informed that the beach in front of the resort is not suitable for swimming. Seating is available on a first-come, first serve basis. Please contact the resort for more details. In an event where the guest name does not match the name on the credit card, the total reservation will be charged with the guest checking in and any fees charged to the credit card used to guarantee the booking will be refunded back. Please note that any airport transfer cancelations made within 24 hours of check-in time (3 pm unless specified), a cancelation fee of THB 1,000 will be charged. We only stayed for five nights and during that time, the a/c broke down, our room was infested with mosquitoes, and towels were not provided. But the biggest issue was housekeeping. We were informed by the front desk that housekeeping will not clean your room (make the bed and provide new towels) unless you request it on a daily basis. Please bear in mind that this is a five star hotel. Daily housekeeping should be standard! Positive: The valet and restaurant staff were extremely helpful. The common areas i.e pool, restaurant and lounge area were modern and clean. Spaciousness of rooms, brilliant views, friendly staff who were absolutely warming n welcoming, felt like home, staff went out of their way, perfect resort feeling and would recommend this resort to anyone wanting a vacation in phuket!!!! The beach was very rocky and you couldn’t swim at it.. maybe the hotel should let that known on booking site. It wasn’t a deal breaker for us because we travelled to the beaches but it might be for some people. The hotel should also advise that there was construction on both sides of the hotel.. a lot of jack-hammering through the day. The staff were extremely helpful and friendly. The staff at breakfast and the buggy drivers were always kind. The pool was great, fresh towels, always clean, always a sun bed free. Golf buggies are used to get one up the steep pathways but there are insufficient, with sometimes long waits. One wouldn't wait 10 minutes for a hotel elevator. We had numerous problems with room key cards not working and this should be fixed. We upgraded to a club room and though we could see the sea, the major part of the view was the roofs of the reception building which don't look great. To the left was a construction site which was equally unappealing. It was also noisy from soon after 8am, even on the weekend. There was another construction site on the other side of the property and a least two afternoons we heard stereo drilling while at the pool. Not very relaxing and though the resort has no control over who builds next door, this should have been disclosed on the website so one can make a choice. Lovely resort set on a steep hillside in beautifully kept gardens. Staff excellent - kind, helpful and knowledgable. Food excellent wherever we ate it. Large room with great bed and bathroom. Huge pool, kept spotlessly clean. Had to wait for the Club car (Golf Cart) everything we wanted to go to our room. Usually 2-3 mins. Suggestion - Hire more golf carts and drivers. Other than that we had an amazing time. It is probably not worth dining and drinking at the hotel as their prices are quite high unless you have access to the Regency Club. We didn't mind the whole buggy experience, but I can understand how some may find it annoying having to call a buggy each time you want to come to breakfast or go back to your room. When we arrived at the hotel they asked us for 10000 baht as a 'holding' in case we used anything from the mini bar / dined at their restaurants. This was pretty inconvenient for us and we were not aware of this prior. We had't changed our money into baht yet so we had to give them $500 AUD cash. If they had told us this earlier we would have withdrawn more cash. A fair distance from attractions or restaurants. Wish there were more local food nearby rather than having to take the bus or cab out for meals. Very serene and relaxing. The regency club is extremely good value for money. My fiancée and I enjoyed winding down here and feeling rejuvenated after.